Homes in Terravita range in size from 1,400 to over 3,700 square feet, and are priced between $400k and over $900k. Terravita Real Estate development currently consists of 830 acres designed for a diverse population of full- and part-time residents of all ages. The gated community features a wide range of home and lot sizes, offering a variety of exterior designs and interior options. Homes are arranged in residential neighborhood enclaves, and nearly every homesite is planned to backup to the golf course or natural open space. Terravita Real Estate offers a casual indoor / outdoor lifestyle and a comprehensive amenity program, including championship golf, clubhouse facilities, Health / Fitness Center, Swim and Tennis Center and a community-wide system of walking and jogging trails. In addition to the features found within the community, Terravita has everything you need close at hand. There is a shopping center with a grocery store, bank, pharmacy, and other retail service establishments nearby. In creating Terravita Homes, the planners and developers took the already strict Scottsdale building guidelines another step, adopting a single-story architectural design that features non-reflective flat tile roofs, and building materials that blend with the desert backdrop. Terravita's professionally staffed health and fitness center offers state-of-the-art excercise equipment, includeing stationary bicycles, stair climbers, treadmills, fitness stations and free weights. Other features include private men's and women's locker rooms and a spacious aerobics room. After a workout, the center offers a soothing massage, steam shower or dry sauna. The private 18-hole championship golf course designed by renowned golf architects Billy Casper and Greg Nash, offers a complete golf pro shop, teaching professionals, and an extensive practice facility. The course reflects and respects the magnificent high Sonoran desert surroundings, creating a true celebration of both the game and its environment. 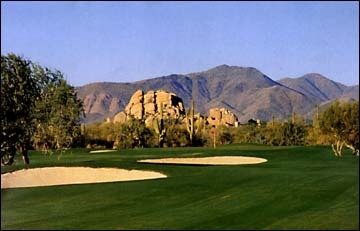 Being awarded an impressive first place in Ranking Arizona 2005 – The Best of Arizona Business listing of the area’s top 10 private golf courses, Terravita is highly acclaimed for its unique attributes.